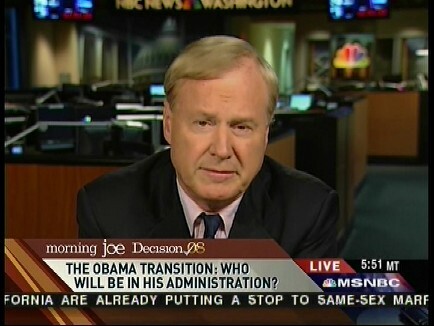 Just in time for the new James Bond movie, Chris Matthews has earned himself a new moniker: Odd Job. Matthews says he sees his job as a journalist as doing everything he can to make the Obama presidency a success. Appearing on "Morning Joe" today, Matthews was reluctant to criticize Rahm Emanuel's kabuki dance over accepting Obama's offer to be chief of staff. Matthews wasn't done with his odd new job description . . . An incredulous Scarborough kept pressing, astonished at such a complete 180 from Matthews's repeated insistence during the Bush presidency that he had to hold the government accountable. Matthews will hardly be alone in that sentiment. Once Obama assumes office, the "speaking truth to power" line we've heard so often during the past eight years will be a thing of the past.